Due to persistently heavy traffic in the cities, one should always leave at least forty-five minutes to get anywhere, even if it is only a short distance away. 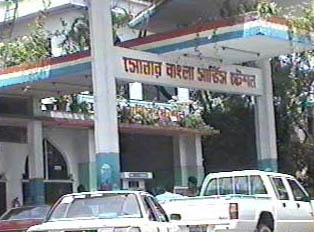 Since the patience of most drivers in Bangladesh is tested on a daily basis, there are many who honk horns and break various traffic laws frequently (sometimes by driving up on the sidewalk). Pedestrians must be extremely cautious when crossing or even walking on the sidewalk of certain thoroughfares. It is sometimes recommended that pedestrians cross at quieter sections of main streets or even go to the side streets to cross. A foreigner should be prepared for the fact that on highways between cities, there is no speed limit nor any system in place to penalize speeding drivers. This accounts, in part, for the high number of car accidents per year.